Lotus Blossom Tank KAL: Finished! I am finally finished with my LBT, and I can not believe how relieved I am to be done with the whole thing. If it wasn't for this KAL, I know I would have chucked the project and added it to my many UFOs. Anyway, from my posts last months, I dropped a bunch of stitches somewhere and couldn't figure out where they were. As a result, I started the whole thing again...did the same thing...then did the same thing again. What happened? I figured out that my yarn was too slippery for my really slippery bamboo needles and my stitches kept falling off without my noticing. (I was using Frog Tree silk/cotton, and it was telling me that it did not want to be the Lotus Blossom Tank.) I put the whole thing away for a week or two, and then started over with Elann.com's Sonata 100% cotton. Much better. Needles: Many—Webs bamboo circulars size 6, Denise size 5, Susan Bates aluminum circulars size 4, crochet hook size F for the armhole finishing. Modifications: 3 Lotus Blossom repeats instead of 4, but added an extra few inches of stocking stitch in the body. I didn’t care for the 4 rows of garter at the top of the lace pattern, so I knit only two rows of the garter stitch instead. I continued the decrease pattern at the top of the front for two extra repeats (8 rows total) to add length in the chest area. I did not want the garter stitch borders around the sleeves and neck, so I used a modified crochet shell stitch on the sleeves, and then left the neck band area plain for no other reason than I liked the clean line of it. Overall thoughts: I like the finished product, but I wasn’t bowled over by the pattern itself. I felt like I had to make way too many modifications to keep it from being a shapeless blob. But all of the changes were well worth the extra work and frustration. I’m really glad I joined this KAL because reading the other posts and seeing you all’s finished objects was very inspiring. That's such a pretty shade in the Elann Sonata! My friend loves this yarn, so I'll need to try it sometime. I like your crocheted shell edging on the armholes and I bet a single crocheted edging would be just fine if you needed to stabilize the front. Nice! I like the 3 rows of lace, and it looks like it blocked really open and delicate. 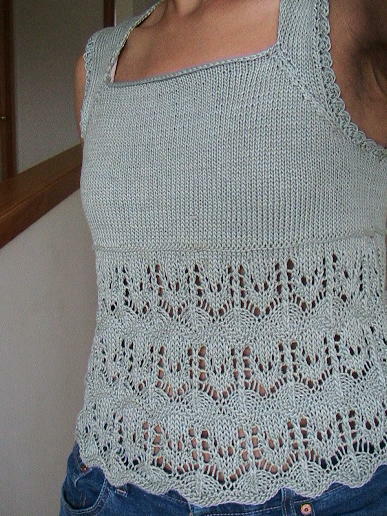 I agree that the most sucessful patterns so far on this KAL all have had shaping alterations, and most people have complained about the bamboo yarn, the sizing, the coverage, the lace repeats, and the the armholes. I love your solutions and your tank looks shapely, lacey and delicate! Nice job! That is such a pretty colour and it fits you perfectly. Great job! I need to get back to mine - I feel a bit guilty letting everyone else figure out all the problems for me! Great job! I really like the armhole edging. I think I might take stilaholic nartian knit's advice and add a row of single crochet around the neck edge. Thanks for the idea. The picture shows only the lace blocked. I'm blocking the rest right now, and I opened up the lace even more. It looks even more delicate. Anyway, I can't wait to see what others are doing with their versions of this tank! I just got my Bamboo yarn in the mail and I am not thrilled with the color and think, now what?? - then I see the texture of your tank - wow, it's fabulous, great fit, wonderful color - I love your modifications and stick-to-it-tiveness! !